So here are the six objects and the answers to the first half of the 32 questions I posted, that every good curator will know. I’d like to iterate that these are ‘easy’ ones for a natural historian and I’m sure colleagues in other fields can think of similar examples. This is the knowledge you lose when you don’t have the specialist on staff or access to a specialist or specialist network to advice. These are the mystery objects I posted and below are the questions I asked, now with the answers! What are these objects? 1 is a close up of organ pipe coral. 2 A human clavicle. 3 Ostrich egg. 4 A Peleides blue morpho butterfly. 5 A sectioned nautilus shell 6 A beaver tail. What are their binomial names? Tubipora musica, Homo sapiens, Struthio camelus or Struthio molybdophanes, Morpho peleides, Nautilus sp. or Allonautilus sp. (difficult to identify to species from this) and Castor sp. (two species). Some people could probably identify the nautilus and beaver from these images alone. What are they made out of? Assuming they are all real of course. This answer could go on and on and on but for the sake of brevity, at a basic level the coral is made of a calcium carbonate ‘skeleton’, the clavicle is made of ‘bone’, the egg is also calcium carbonate, the wing is made up of chitin, the nautilus shell aragonite (also calcium carbonate) and the beaver tail is skin, bone, fat and muscle. Already I can hear the biologists screaming at this gross oversimplification and some of these materials are themselves entire fields of study and scrutiny in material science. Which ones are illegal to own? The short answer is, potentially all of them, of course if these are stolen from a legal owner all could be suspect when thinking about adding these to a museum collection. Additionally there are complex layers of legislation protecting certain areas so although the species may not be specifically protected collecting any of these from certain places will be so you have to be aware of international legislation (this is tricky given that getting your head around the UK legislation is complicated). Depending on how the specimens are prepared legislation involving tissue or potential pathogen containing material is strictly controlled too. Many countries also specify the nature in which animals are caught or killed, in Great Britain for example Section 11 of the Wildlife and Countryside Act prohibits the use of self-locking snares, bows, explosives or use of live mammals or birds as decoys, for capture and killing of any wild animal. So the species may be fine but the way in which something was collected could cause it to be an illegal specimen. Beyond the ‘trick’ answer, there’s legislation governing the collection and ownership of all of these. The international trade for the coral and the butterfly are controlled and require permits to collect, export and import. Depending on the age and provenance, the human bone will fall under the Human Tissue Act or if it is is archaeological a whole other load of legislation comes into play. Some populations of ostrich are protected by trade legislation and on top of that all imported ostrich eggs need to be covered by this specific ostrich egg license. European beavers are protected by the Habitats Directive although reintroduced British beavers exist in a grey area as they should be protected by the Wildlife Act but haven’t been listed yet so they are partially protected under Habitats regulations and Conservation of Habitats and Species Regulations. Nautiluses are slightly odd one given that some species are protected by Indonesian, Philippine and Chinese law, however there’s no International legislation on trade. Most experts agree that given how the various species occur in very small distributions and some species are slow breeding, they should be better protected but there just hasn’t been enough surveying of existing populations or the trade in them to feed into better protection or listing (none have been assessed under the The International Union for Conservation of Nature(IUCN) which is worse than data deficient). Which ones are unethical to own? Of course, it depends on your ethical code. Thanks to the factory industry in Museum Studies dissertations on the ethics of human remains collections, many museum professionals will be wary of human remains but all of these should be given ethical consideration. Handily the Museum Association has recently updated their Code of Ethics and there’s plenty that should be taken into consideration with respect to these specimens, particularly with reference to individual and institutional integrity which when it comes to natural history there are issues that arise from ‘above the law’ culture amongst a rotten minority of collectors. As a rule of thumb, if you would hesitate to put the entire history of the circumstances into how the specimen came into the museum on a potential display label then think again about acquiring new material. As for the older specimens, one of the ongoing challenges of museums is to reconcile contemporary use of collections acquired in the past in a way which today we would consider unethical (but shouldn’t shy away from). Which ones need a license to display? Again, the human bone, depending on the age, may need a public display license and consent from the person whose remains are under consideration. If the display, or use is commercial i.e. you charge for an exhibition then you will need a certificate to legally display the ostrich egg, if it is from a protected population. Which ones are marine? The coral and nautilus. Which ones are real? This can be very hard to tell as butterflies, bones, mollusc shells and eggs do have a history of being faked, particularly when it comes to ‘rare’ specimens and fanatic collectors. With the beaver tail, taxidermy can be entirely reconstructed in parts (noses and mouths in particular). Casts and replicas are always improving in life-like realism and some natural materials are so odd, they look and feel synthetic. In general, it can be very difficult to authenticate natural history specimens or objects inlaid, guilded and decorated with animal materials. Dr Sonia O’ Connor is an expert who runs training on identifying horn, bone, shell, plant ivory and animal ivory and some of the objects she’s examined can be a mix of all three. In the above images, all but the human clavicle are ‘real’, the clavicle is plastic. What country do they come from? With my collections manager hat on, I’d say, you can never tell where a specimen has come from if you don’t have strong primary evidence of origin. If not collected from the wild, specimens can be bred in zoos, wildlife parks, laboratories, the pet trade or farmed. They can also be translocated deliberately or accidentally so may be wild but not ‘natural’ and this will affect all aspects of the morphology and life history of a specimen. With that caveat out of the way, the corals come from the Indian and Pacific oceans. Humans have infected almost every corner of the globe. Both living species of ostrich are native to Africa but are farmed all over. The butterfly is found across southern North America, Central America and northern South America. Nautiluses are found in the Indo-Pacific and beavers are native to North America and Eurasia. Again, this is hugely simplifying the picture especially as some of these are contested species, some have erroneous outcroppings and many have been muddled by human activity. Of course, the complexity is all part of the wonder of natural history but makes writing general answers very very difficult. Which ones are animals? On one level, this is a trick question, they all are. Although, in my experience, people forget that we are ‘another animal’ and the coral can cause confusion. 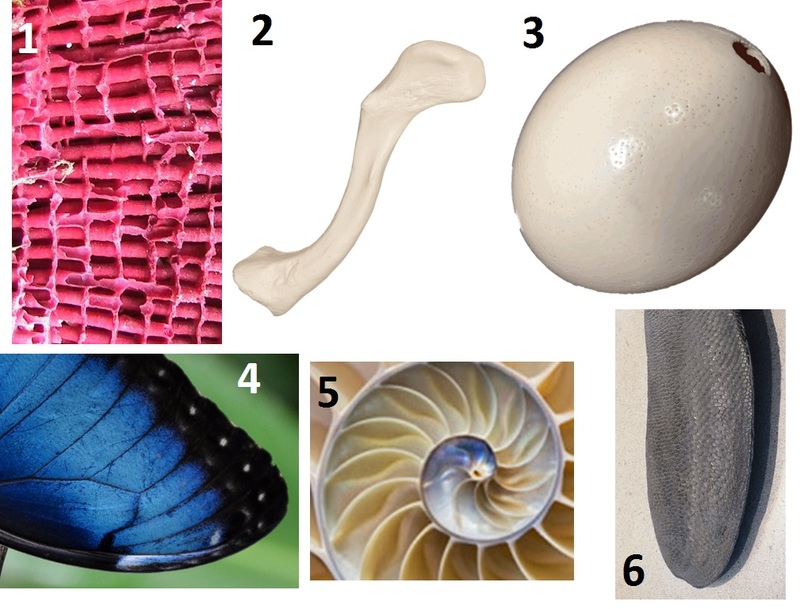 On another level, we could quibble that the egg isn’t an animal, the bone, butterfly, shell and coral are skeletons and the beaver tail may have some soft tissue so may be ‘more’ animal than the others. Again, endlessly interesting to debate in a Museum Studies Philosophy 101 class not so much here. Which ones are dangerous to touch? Another rule of thumb, unless you know otherwise, assume they all are. The history of techniques used in preparing natural history specimens has used all manner of nasty chemicals to prepare and preserve specimens. Insects and taxidermy may be coated in or stored with toxic chemicals used to prevent pests eating them. The others are normally stable but of course any direct handling will be dangerous to the specimens as the fats and oils we all secrete will stain and erode the surface and most of these are fragile. Which ones should be handled with PPE? I’m taking a hardline stance. Unless there’s a compelling reason not to, you should wear gloves to ‘handle’ all of them (probably no need to touch the butterfly directly anyway) for reasons stated above. Depending on what the rest of the beaver specimens looks like and what you are doing with it, you might want to wear a mask and lab coat as old taxidermy is often covered in arsenic and other toxic chemicals. If presented with these by a visitor, which ones might you phone the police about? Obviously, depending on the context it may be all of them. If a visitor turned up with a suitcase filled with of any of these (it happens), wanted to sell them and was cagey about filling out any paperwork, I’d be wary. As covered above with the legal aspect, if you have suspicions about the provenance of any of these you may have to inform the police. Again the sensitivity is around human remains so you’d want to make sure the police aren’t interested but any of the others could have been maliciously or accidentally illegally collected and imported. This can often lead to a difficult conversation so you may wish to have a policy about what you do or say when confronted with a potentially illicit specimen. For example, in Scotland it is illegal to collect any of these animals, even if the are dead without a license. That bone you picked up on the beach in Scotland? If it’s a whale, you’ve technically broken the law. Which ones are okay to buy on eBay? I’d advise avoiding eBay completely when it comes to natural history specimens. Although, in general some specimens and species should be okay to technically buy this way, the arms length relationship with the seller makes it hard to verify all the information museums need to make a legal and ethical purchase. Also, don’t rely on the fact that it’s being sold on eBay to mean that it’s a legitimate sale. eBay and for that matter many auction houses don’t vet the items they sell. Colleague Sarah Durant regularly bugs the seller on Twitter about the sale of lion specimens and parts, no questions asked and even outright, internationally illegal to sell animal parts like ivory can still be found. What would you need to do to send these to America? The short answer is do your research! Although international legislation covers the basics, you need to be au fait with how international and national legislation is implemented at a regional or state level. Some of this is down to local legislation at other times it’s due to the experience and competence of the port authority. I’ve been bounced from government department to government department looking for advice in the UK, outside of your home country, especially if there’s a language barrier, this can prove exasperating and once a year I say I get a phone call from an art gallery importing a sculpture or work that incorporated animal remains that they didn’t even know would cause a problem (and at the point of seizure there’s little that might be done). Sometimes specimens may be confiscated, not because the import was problematic but because the re-export isn’t covered and sometimes this is in surprising ways. For example, and I’ve never heard of this ever being enforced, ALL primates are CITES appendix 2, EU Wildlife Legislation Annex B which includes humans. Also, fossil corals are specifically exempt but no other groups are which is interesting for animals like hippos, hyaenas which we also get in the fossil record. This is the kind of stuff that natural history curators and registrars are all over so if you have one you know, ask them. If it came to it, which are edible? Assuming they are all real, all of them can be powdered to be edible but depending on the way they’ve been prepared and treated, expect some adverse side affects beyond a dodgy tummy. Which ones are extinct? We tend to think of extinction at the species level, that is, species are globally extinct or not but sadly there are a lot of species which may still be with us but extinct from a continent, country or region which we call extirpation. Assessed in 2008, the organpipe coral doesn’t seem to have disappeared from its range but historical data isn’t great. Humans are stable at the subspecies level. Common ostriches have become regionally extinct in Libya and a Arabian subspecies is also extinct. The Somali ostrich has only recently been described so the historical range is not known. The common morpho hasn’t been assessed and as I mentioned above, all living nautilus species are under scrutinised and there are a number of dubious species which confuses things further. Eurasian beavers are regionally extinct in Moldova, Portugal and Turkey and have been reintroduced in over 20 northern European countries and are back but not established in the UK. ← Why Don’t More Men Work In Museums?